Bad news and good news. The bad news is that the famed website cwartillery.org is no more. The good news is that the core information – if not the lively, efficient design – is still available online. Unfortunately, original author Chuck Ten Brink can no longer maintain the site, but he has passed the material to the care of the Robinson Artillery. 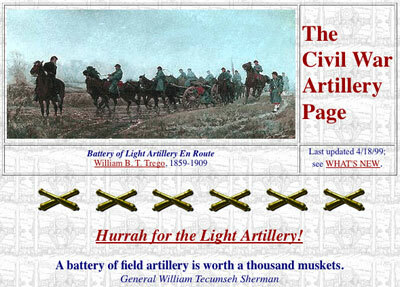 It begins on their Civil War Artillery page. Chuck first put his work on the subject on the Web in 1996, and has been thereafter the go-to guy for many of us on terminology, equipment details, guns and artillerists, and (in partnership with Wayne Stark) the Civil War Artillery Encyclopedia and the National Register of Surviving Civil War Artillery (sample: Antietam’s page c. 1998). I’ll very much miss the old site, but say Hurrah, Chuck, for your long online service! Wow, I was trying to find this web site and couldn’t, thanks so much for the information! I’ve found the page I needed. Chuck Ten Brink’s site has been a great source of artillery information for many years, I’m glad it’s being kept alive!